Thatcher Brown has over 20 years of experience in the hospitality and travel industry, having previously served as Executive Director of Brand Marketing for Fairmont Hotels & Resorts and as Director of Marketing for Crystal Cruises. He has also held management positions at the Four Seasons Biltmore Resort, Santa Barbara; the Savoy Group; and the Barrows House in Vermont. Brown graduated from the School of Hotel Administration at Cornell University with a BS in international management. Prior to launching James Company Contemporary Arts Project, Katie Gass held posts at the Whitney Museum of American Art, the Chase Manhattan Bank Art Collection, Curt Marcus Gallery, and the Aldrich Museum of Art. She is a member of the International Association of Professional Art Advisors, the National Organization of Women Owned Businesses, and Art Table, a national organization for leading women in the arts. She serves on the board of Skowhegan School for Painting and Sculpture and is a board member of the Sadie Nash Leadership Project. She received a degree in painting and art history from Ohio Wesleyan University and earned an MA from New York University. Located on Central Park South in Manhattan, the Jumeirah Essex House (www.jumeirahessexhouse.com) first opened its doors in 1931 and recently completed a $90 million soft goods refurbishment program that included all of the hotel’s 515 luxury guest rooms and suites, lobby, and health club and spa, as well as its restaurants and bars. The property is owned by the Dubai-based Jumeirah Group, which owns and operates luxury properties throughout the world. What was the impetus behind the expansive, $90-million refurbishment project at the Jumeirah Essex House? Brown: When Jumeirah became the manager of the hotel, the group wanted to restore the heart and soul of the Jumeirah Essex House and make it innovative and relevant to the needs of the contemporary traveler. We wanted to honor the past while being aggressive in repositioning the hotel to make it distinct. That’s when we decided to raise the visibility of the hotel in the community through the arts and we hired Katie [Gass] as our curator. Gass: We wanted to celebrate the 75-year history of the property and its proximity to Central Park, so that became a natural theme for the art program. We wanted to explore art accessible to travelers, as well as to encourage Jumeirah to become a patron of top-level contemporary artists and culture, which is a role it has embraced by commissioning new work. To further Thatcher’s point about restoring the heart and soul of the hotel, we have also explored the history of the park through images culled from the archives of the Museum of the City of New York, and other sources, and have created an exhibition in the lobby that celebrates people’s love for the park and the ways it has been used over its 150-year history. How have you managed to engage the community and your guests in the Jumeirah Essex House’s art collection? Brown: One way we have done that is by offering both our guests and the community free walking tours of the park and arts-and-architecture walks. Guests can see images of the park in our hotel and then see them in person in the park. It makes the art so much more tangible to them. Guests can also download the tours to their iPods. We’ve also tried to make the collection accessible to families. For instance, we’ve hung the image of Balto the dog very low so that children can easily view it. These subtleties are important to making the collection relevant to our guests and to the hotel. In fact, Katie found an Essex House sales brochure from 1934 that inspired us to think about the nobility and history of the property. In the brochure, we found a beautiful statement: “Always in touch with the park, never out of touch with The City.” Those words have helped us to understand the hotel’s timeless positioning statement. It’s the filter we look through in making any decision to elevate the guest experience, from flat-screen TVs to our art program, to the other things that touch the heart, soul, and character of the Jumeirah Essex House experience. It’s hard to describe, but the guests feel it. Does the art program serve as a point of differentiation for the Jumeirah Essex House as you try to distinguish the property from its competitors? Brown: Yes, but it has more to do with the intimacy that we can create with our surroundings and our involvement in the community. This is a 515-room hotel that sits practically smack dab in the middle of the southern base of Central Park. We are a historic anchor in the community, and our location is important. 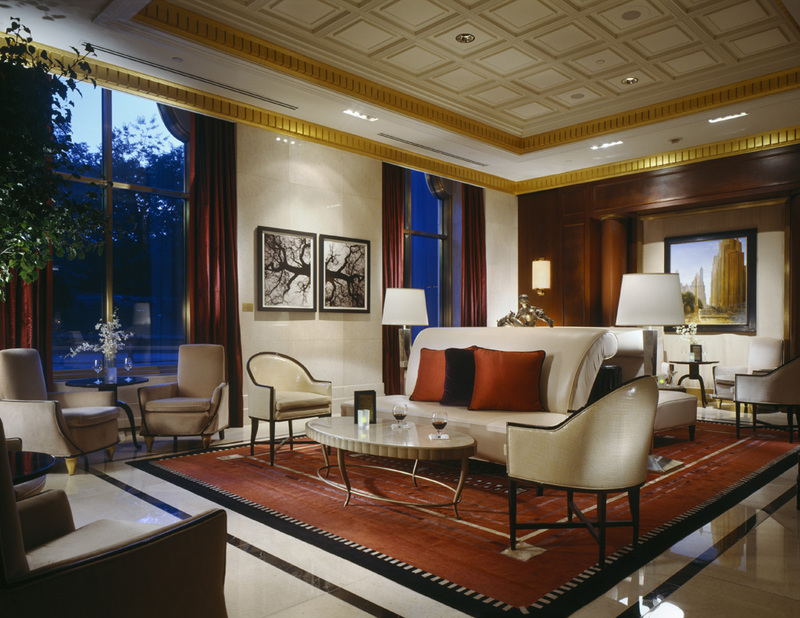 Our art deco design and residential feel are very intimate, and so is our level of service. Each of our employees participates in the art program and we feel we are enriching them so they can be more active in their communities. This is a genuine effort; it’s not a commercial effort. It has to do with being a good neighbor and bridging communities. It’s amazing how many relationships grow organically from a genuine commitment. We’ve partnered with CentralPark.com to create walking tours for families, for instance. So our hotel is aligned with the culture of the community in a very natural way. Part of being a leader is realizing there’s value to embracing the community, as opposed to feeling paranoid about your competitive position.